Each week of Lent, we’ll provide an Ignatian prayer for you, inspired by a video from Arts & Faith: Lent. 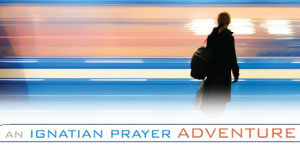 The video and prayer for the Fifth Week of Lent, Cycle A, are based on John 11:1-45. Imagine you are walking on a small and narrow path through a forest. There are trees and plants on each side of the path. You stop and look up, but you can barely see the sky through the tree limbs heavy with leaves. There is the sound of crows squawking, but you cannot see them. You are walking because you needed time alone, time to think about what is next in your life. You feel like there is something you are supposed to be doing, but you cannot figure it out. If I give myself some time alone, you think, maybe I will begin to understand what’s next. You are looking down at the narrow path so that you can see the rocks and roots on the path and not trip. As you walk, you hear a sound that makes you stop. You look around, but it’s hard to see through all the foliage. You continue on the path, but the sound gets louder. As you look ahead, you see someone sitting on a large rock under one of the trees that line the path. He is holding his head in his hands and seems to be crying. As you approach him, you realize he is not just crying, but weeping so hard that his body is shaking. He looks up at you with a tear-stained face. You see that he is Jesus. What do you say to him? You stand there in front of Jesus, wanting to reach out but unsure how to do that. You want to comfort Jesus, but that seems so opposite to what you’ve been taught. He is the one to comfort me, you think. He stands up and says, “My friend has died, and I must go to him.” What do you say to Jesus? Jesus starts to walk towards the path, but he turns around and beckons you to come with him. He reaches out his hand, and you take it. You walk along the path with Jesus and feel at peace. You don’t know where you are going, but you know that wherever it is, Jesus will be beside you. Jesus looks over at you and smiles a small, knowing smile. What do you want to say to Jesus? What do you want him to know about you? Is there a decision you are wrestling with that you want to bring to Jesus? How would you comfort Jesus as he weeps for his friend? Read a transcript of today’s video here. The art is János Vaszary’s Resuscitation of Lazarus. I am inspired by your Arts & Faith presentation. It moves me to go deeper in the encounter with Jesus. Thank you very much. I find the Arts and Faith site very inspirational, my only complaint is that there are not more!